Life is hectic; it’s true. There are so many things that demand your time and attention. Between work, kids, family and household chores, there is precious little time left over for you. So, it is completely understandable why things like hairdresser reservations get pushed to the end of your priority list. But is it at the end of the “to do” list where your next hair trim belongs? The answer to that question is, of course, no. There are many reasons why you should keep your hairdresser reservation. Aside from taking a little bit of time and relaxation for yourself, which I know is not going to motivate you since all of your energy goes toward enriching the lives of others and not your own, there are many practical reasons why you should not call and cancel your next reservation. 1. Keeping up with hair maintenance saves you time. You know how it is, your hair is doing just fine until that fateful morning on which you realise that your hair is way past due for a trim. It just won’t do anything. So, after hours of trying to coerce your hair into the style that it held beautifully just yesterday you resign yourself to the fact that nothing except a haircut will fix your bad hair day. But we all know that a spur-of-the-moment haircut is hard to come by. That means that you will spend the next week or so wasting time trying to style your overgrown locks while waiting for your reservation. Only if you would have kept your original reservation. You see, getting a regular trim, even if you think you can squeeze by another week or two, prevents this mess from happening in the first place. A cut that is the perfect length and shape will be a breeze to style in the mornings, and that will save you time. 2. Keeping your reservation saves you money. If your stylist has regular opportunities to keep your hair in tip top shape, he or she will have to do less in the long run to keep you looking beautiful. If you continually let your style grow out or let your colour fade, your stylist will have to do more work to bring your wayward tresses back in line again. More work equals more time, and we all know that time equals money. 3. There is never a better time than today to get your hair done. Sure, we all think that we’ll have more time next week, that our workload will be less than it is today. But does that ever really happen? Let’s face it; next week will be just as busy as this week. And when you’re busy, a little bit of R & R will give you the energy that you need to keep going. 4. Another reservation is weeks away. Why do you go to your stylist? It’s because he or she is a fantastic stylist and knows your hair inside and out. Well, if your stylist is this great with you, I’m sure there are other clients dying for your stylist’s services. If you miss this reservation, it could be weeks before you get another one. 5. Keep your reservation out of respect. 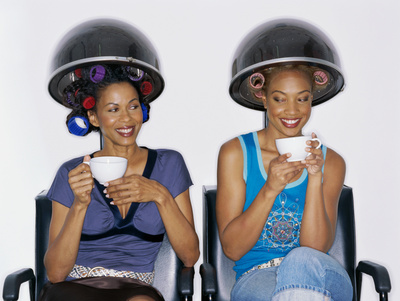 When you make a reservation, your stylist carves out time from a hectic day to cater to you. If you don’t show or cancel at the last minute, your stylist will end up sitting around making no money when he or she could have filled that time slot with another guest. Cancelling reservations repeatedly may cause you to be placed on a pay in advance or last minute reservation list. Or even in some cases you can get fired for missing too many reservations. Granted, sometimes things happen that make cancelling an appointment a necessity. When this is the case, be sure to give a minimum 24 business hours and reschedule as soon as you can. Not only will your stylist thank you, but your hair will as well.